I have concentrated on the early history, especially the time up to 1920. The earliest record of any Methodism in our area, was on August 7th 1854 when William Creamer donated some two acres of land to the Wesleyan Mission (see part of deed of transfer) "to be for the site of a Wesleyan Chapel and for other purposes of the Wesleyan Mission". William Creamer had come from Australia on the "Border Maid" which left Geelong in November the previous year. In the History of Birkenhead, Margaret McClure lists him as John Creamer, although in the deed of transfer and in the shipping lists, he is shown as William. Little is known of him except that he was one of about half a dozen or so who were farming in the area at the time, others were de Jersey Grut, Henry J.Hawkins, Hugh McCrum, Joseph Hill, James Fitzpatrick and William Bradney. When de Jersey Grut came to Duck Creek (Chelsea) in 1856 he hired from 'John" Creamer a team of bullocks and a driver and began ploughing. 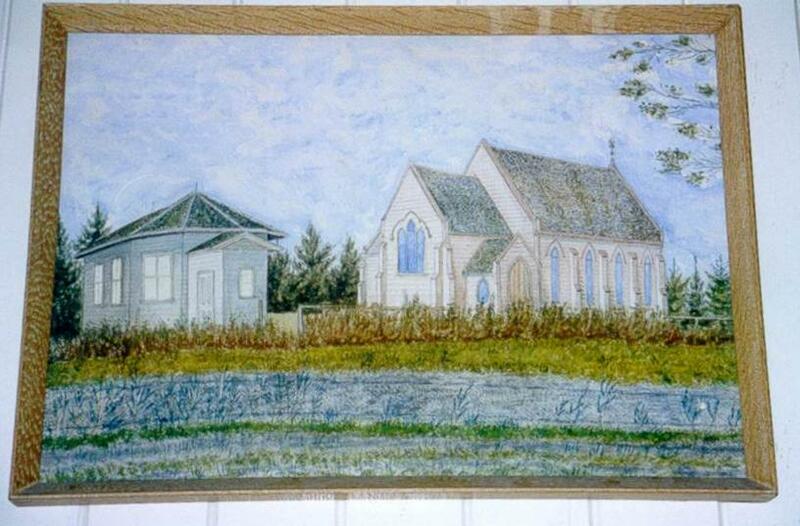 For thirty years, nothing was done about building on the church site. 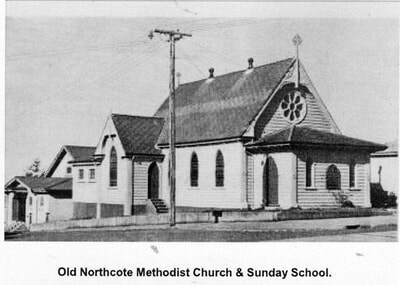 Many Methodists attended St Johns Anglican Church at Northcote which had been consecrated in 1860. By the end of the 1870s the Methodist community from Northcote and Birkenhead was becoming increasingly eager to have a spiritual home of their own. The group began holding cottage meetings, gathering in one another's homes to sing some of Wesley's beautiful hymns and to pray together. By the beginning of 1880 the fellowship was sufficiently strong, both in numbers and commitment, to begin plans for building their own church. The little congregation probably dreamed of building an imposing ediface, in keeping with the outstanding location, but funds were short and the future uncertain so they opted for a more modest, octagonal structure, designed by a resident, Mr William Francis Hammond. The building was completed the same year by Mr Charlie Johnston at a total cost of £180. At that stage church members numbered only some half dozen families but they managed to open the 70-seater building debt free. Initially worship was held at 3pm following Sunday School at 2pm, but was changed in 1882 when the North Shore Circuit was formed and morning and evening services were held with the Sunday School still being held in the afternoon. In later years a Presbyterian minister - the Rev. McCallum - standing upon its summit and gazing entranced across the land and seascapes stretching away unto the dim horizon, quoted the Psalmist's old familiar words "Beautiful for situation, the joy of the whole earth is Mount Zion." Hence the name, Zion Hill. By September 1884 when the Sugar Works at Duck Creek began operation, the Zion Hill congregation had grown too big for the little octagonal chapel, so Mr J.Pickering prepared plans for a much larger and more striking Gothic-style church, with seating for well over 200 people. 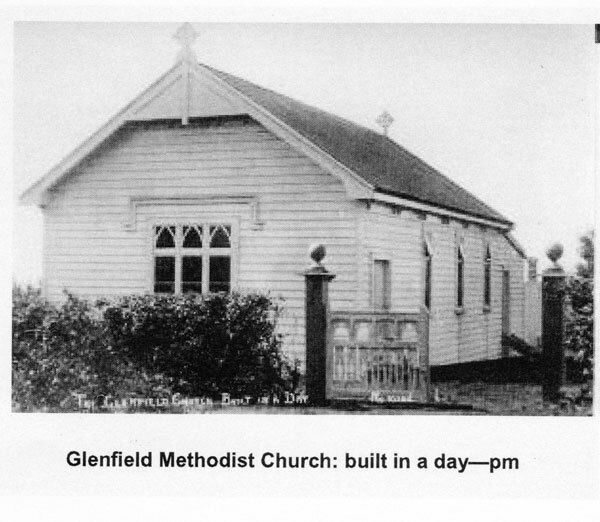 The new church, opened on March 29th 1885, was built by a local resident and church member, Mr James Flewellyn. The old church took on a new lease of life as the church hall. Construction and design of the new church cost the small congregation more than £600. It took many cakes, biscuits and produce, but the debt of £250 was paid off by end of the century. In 1888 when the first Borough Council was formed, they met in the old church for many years. This is remembered today by a plaque in the old church room. Meanwhile the Northcote Methodists were becoming restive. They had either being attending St Johns, or Zion Hill. They began holding their own house meetings about 1890. Occasionally a preacher would be rowed over from the city in a whale-boat and would conduct services in the dining room of Mr.R.J.Souster's home: Kennilworth. Eager to find some place of their own to meet, in 1893 they bought a large marquee and erected it on Mr Souster's lawn. This Deed made the seventh day of August one thousand eight hundred and fifty four Between William Creamer of the North Shore/near Auckland in New Zealand Settler of the one part and The Reverend John Whiteley of Kawhia in New Zealand aforesaid Wesleyan Mission of the other part Whereas the said William Creamer is deterous of setting apart the piece or parcel of land and hereditamentsherein after described for a site for a Wesleyan Chapel and for the use of the Wesleyan Mission in New Zealand to be used for the bona fide purposes of the said Mission And whereas it has been agreed that the said piece of land and hereditaments shall be conveyed to and vested in the Chairman for the time being of the Auckland District upon the trusts hereinafter set forth and declared…………. 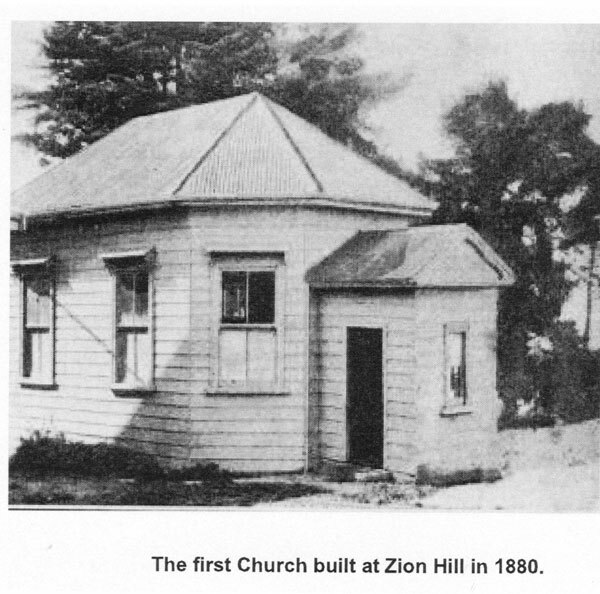 The first Church built at Zion Hill in 1880. They became part of the Devonport circuit and secured regular preachers. They found the next winter hard and so erected a 24ft by 15ft Mission Hall on Mr Souster's land. The hall was soon found to be too small and the site in Queen Street which had been known as the "Bartley Estate" was acquired. The Mission Hall was moved to the new site using the "winch and anchor" method. This took several days. On the second evening it was outside the hotel. At closing time (9pm) several drunken men could hardly believe their eyes. They burst in, lit the lamps and held a service of their own. One member presided at the organ and they sang until 2am! On Sunday it was still on the road and services were held where it stood. In arrived at it's new site in time for the laying of the foundation stone on January 5th 1901. Some extensions were made. During one service, the building narrowly escaped being burnt down when a Miller lamp flared up, melted the chain and fell with a crash to the floor. 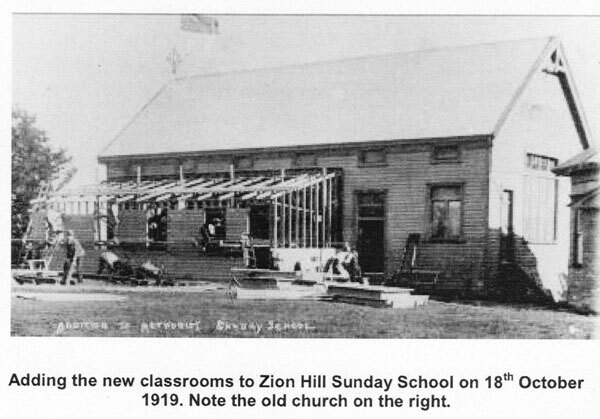 A Sunday School was started in 1901. A Wesley Guild was commenced. By 1909 the church was again inadequate and so the church was again extended and two Sunday School rooms were built by Mr.G.Carter for the price of £246. By 1912 the Sunday School was flourishing with a roll of 144 scholars and teachers, a creche was started to look after the teachers' babies, an orchestra was formed and children's cantatas were presented. But accommodation was a problem. The cottage next door was purchased and the Masonic Hall was hired for 6/- a Sunday for Sunday School use. They even set up the Sunday School Messenger Cadets whose duty it was to carry messages from the Sunday School each Sunday to all the absentees! Meanwhile the church had once again become too small. So in 1918 the whole church was remodelled, a new organ donated, pews installed and an imposing porch erected for a cost of £254. The Sunday School situation was unsatisfactory so in 1922 a new modern Sunday School was erected for a cost of £2031. By 1928 this was extended by adding two more classrooms to the back of the church. During the 1920's, attendances at Northcote were larger than those at Zion Hill. It was stated that "musically, there is nothing finer in Auckland than the Northcote Methodist Sunday School Anniversary". This church is now the home of a Tongan Methodist congregation, and a new Church complex has been built in Greenslade Crescent. 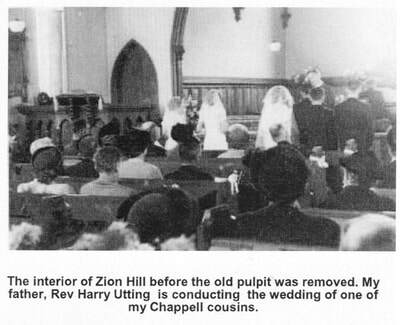 The Zion Hill Methodists experienced the same space problems. 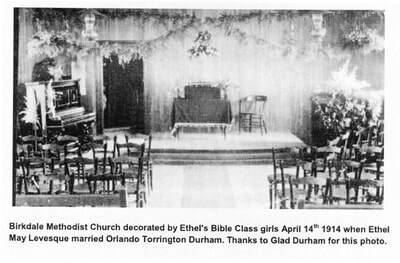 The old octagonal church soon became too small for the Sunday School so in 1901 the old church was shifted back on the section to make room for a new hall which was completed by Mr Fred Souster in 1902 at a cost of £558-0-11d. It was a wonderful acquisition both for the church and the community. Since then further additions have been made. On the 18th October 1919, the new classrooms were added in a day. In 1928 the kitchen and toilets were added and in 1939 the old church was lifted up and joined to the back of the hall, with a basement classroom beneath it. In the church, the old pulpit was removed in 1957. In 1958 the rotting dummy buttresses were removed. The illuminated neon cross which adorns the Church, was dedicated on 26th April 1964, to the memory of Mrs Beatrice Price and Miss Jean Wilson. In 1984, the church and the hall were joined with the addition of the lounge and three classrooms. Meanwhile Methodists in Birkdale started services in their homes about 1890, and from 1894 until 1908, met regularly in the Birkdale school. 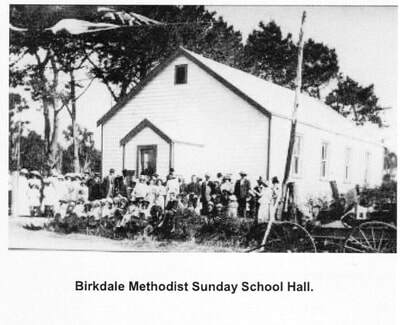 A section in Birkdale Road was bought from the River Plate Land Co on 13th Old Northcote Methodist Church & Sunday School. Zion Hill Church and Sunday School in 1902. Adding the new classrooms to Zion Hill Sunday School on 18th October 1919. Note the old church on the right. July 1907 for £7.10.0 and a church was built later that year by Mr Langsford at a cost of £334.16.1 for building and furnishings. It was opened in 1908. The Sunday School here also grew and in 1916 it was decided to build a Sunday School Hall. With only £42 in hand the Sunday School Superintendent, Mr. George W.L.Fordham took responsibility for raising the other £200. My grandfather, Mr Frederic Clement Utting supervised the building of a Sunday School hall using labour from the church. Many local groups used the buildings. Glad Durham recollects the YMCA classes that were held there by my uncle, Cliff Utting. After the Beach Haven Methodist Church was built in 1939, the congregation dwindled and the Hall was sold for £150 for removal in 1942, and the Church was sold in 1944. Much of the timber was used to build a parsonage at 107 Glenfield Road. In 1956 the land was bought by the Presbyterians and they erected their Church on the site. 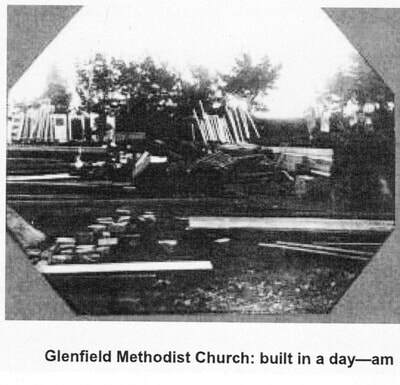 In Glenfield, Methodists began to hold services when the school was built in 1891 - different denominations using the building on different weeks. As the district grew, the need for a church became increasingly urgent until the Wilson, Runcieman, Edmonds and Geddes families organised the district to rally together for the building of a Mission Hall on a part of the Douglas property. The hall was built in a single day. After careful planning, on 4th September 1915, Glenfield residents and helpers from Birkenhead rallied together. Work commenced at 5:30am and by 6pm the building was complete in every detail, including an impressively ornate double gate and gate posts. From that day all church services of all denominations and Sunday School classes were held in the Mission Hall. In 1973 a combined Methodist/Anglican Parish was formed in Glenfield. 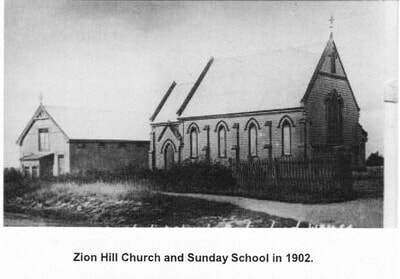 References: Zion Hill Church & Sunday School Jubilee 1880-1930 75 Years of Methodism - Birkenhead Methodist Church Zion Hill Methodist Church -The Past 15 Years - 1955- 1970 100 years of Christian Worship - Zion Hill Methodist Church 1880 -1980 Birkenhead - The Kauri Suburb by Murial Fisher and Bill Hilder. Northcote Methodist Church Jubilee Record 1895 - 1945 The Story of Rural Glenfield by Valerie Rounthwaite St Philips Union Parish Beach Haven-Birkdale History The Story of Birkenhead by Margaret McClure Research by Reg Woodhams on Zion Hill Church. "My grandparents were among the half dozen families who established the Methodist cause in Birkenhead. Of course there have been many changes over the years. In my young days I can remember walking along muddy wet roads to church and other meetings, carrying a storm lantern to light the way. The womenfolk had to take extra shoes and sometimes stock-ings as well to change into on arrival. There was a fireplace in the old church, and on cold wet nights there would be a row of wet boots in front of the fire to dry while the meeting was held. For a while it was my job to light the lamps in church on Sunday nights. It was gas in those days, and not very good gas either. At times the light was very dim and sometimes the flame would flicker and pop. At times mantles would burn out or the glass globes would break, and those sitting below would get a shower of hot glass around them. When electricity was installed, this excitement died out, except when there was a power failure, which was fairly frequent. Other changes came with the addition of the classrooms and kitchen in the hall. A gas ring and later an electric stove replaced the old boiler at the rear of the church. In the early days the old brick copper had to be stoked up before social functions. When the water boiled it was put into large tea urns and carried to the hall. This could be a rather precarious operation on wet dark nights, but it had to be done and we got a lot of fun out of doing it -- except when the wood supply was damp, or was running low. In the old days the morning service was at 11 a.m., and all the family attended. Sunday School and Bible Class were at 2.30 p.m. Evening service was at 7 p.m., and it was a great event when one was old enough to be allowed to go to church at night. In those days the church was usually full for both services. In the late 20s and 30s, however, when the motor car became a popular member of the family, attendance at Sunday School dropped considerably as did the services, especially on fine Sundays. In the early days of the church, night meetings were arranged according to the phases of the moon. Electric torches were unheard of at the time, and, although every one took a kerosene hurricane lantern when they went out at night, it made a big difference if the moon was bright. It was quite an art, especially on windy nights, to keep the lanterns burning without getting the glass blackened by smoke. At first the Birkenhead minister had to supply his own horse or push bike for transport within the circuit, but in the early 1920s the circuit bought its own horse and gig. "The horse paddock was the corner block of Zion Road, where the parsonage (now King & Trounsen) now stands, and there were stables on the northern half of the lower tennis courts (now the bottom car park). As some congregation members still came to church by horse and gig, the stable had room for three or four horses with their carriages. From 1926 until about 1930 I did the circuit driving on Sundays. This involved taking visiting preachers or students out to Greenhithe, Albany or Glenfield, and usually Birkdale as well, on alternate Sundays. On the other Sundays, our own minister often had to go to Albany through about six inches of base course metal on his push bike. This was quite tough as, when he got home, at about 6 p.m., he had to usually get ready to be at Northcote by 7 p.m. I have vivid memories of getting home from church about 12.30 p.m., then leaving about 1 p.m. to catch a very cunning horse. When feed got short in Birkenhead he was taken down to John Court's place in Marama Tce, and he had to be ridden, bare back, to the church so he could be harnessed to the gig. Then I would have to meet the preacher and take him out to Greenhithe or Albany. Barney, the horse, could do the trip in an hour, wet or fine, despite the very slippery state of Greenhithe Rd. The return trip was not so quick. Coming up the long hill, we all used to get out and walk, meeting the horse at the top. By this time with the roads in terrible condition, the gig usually looked more like a dray. In 1931 the gig was badly damaged in an accident (this occurred while his father was driving it - see his father's account below), so the horse was sold and a roster of motor vehicles arranged to transport visiting ministers. Our own minister had to provide his own car, although the church paid running costs."